The annual Philadelphia Folk Festival returns for its 57th year this August, and just announced its initial lineup, led by famed country singer-songwriter Wynonna Judd and her current band The Big Noise. After appearing at the 2015 NonCOMM-vention, Judd and the band released their self-titled debut, Wynonna and the Big Noise, in 2016; the album featured collaborations with Derek Trucks, Sudan Tedeschi, Rapheal Saadiq and more. Valerie June‘s atmospheric soul is portrayed through her newest single “Two Hearts”, off of her soon-to-be-released record The Order of Time. Stepping into a summer night of reflection, June soulfully proclaims a broken connection between two lovers perfectly complemented by a vibe that recalls a Beach House baby with the state of Georgia. Valerie June did a lot of performing in quiet settings for her 2013 LP Pushin’ Against a Stone but do not — repeat, do NOT — pigeonhole this Memphis-based artist as a quiet folkie with a ukulele. June is getting ready to release her latest outing, The Order of Time, on March 10 via Concord Music Group, its first single made its way into the world today…and the name of the song couldn’t be more appropriate. Little Comets and Valerie June shared the stage at World Cafe Live for a double header Free At Noon. June played an acoustic solo set, while Little Comets performed a set of their jangly, angular worldly rock and roll. Listen to the Little Comets’ set here. All photos by Elizabeth Mazenko. Valerie June is WXPN’s Artist To Watch for the month of July. Her debut album, Pushin’ Against A Stone is out on August 13; she performs at the Tin Angel on Thursday, August 15. Combining blues, gospel, folk, R&B, bluegrass and Southern soul, June makes the most of the niches, highlighted by her confident voice. Like the Alabama Shakes and Laura Mvula, Valerie draws on the past to create something new, fresh and exciting. Below, download “Workin’ Woman Blues” from Valerie’s forthcoming album via NPR Music’s Heavy Rotation: 10 Songs Public Radio Can’t Stop Playing. 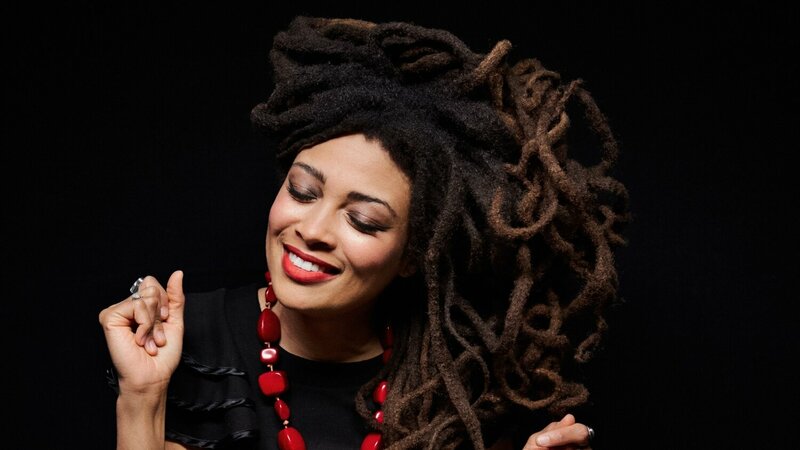 Write this name down: Valerie June. The Tennessee born singer-songwriter and multi-instrumentalist is releasing Pushin’ Against A Stone on August 13 on Concord Records. Recorded mostly at The Black Keys’ Easy Eye Studio in Nashville and produced by Dan Auerbach and Kevin Augunas, June exhibits some very impressive musical versatility on her debut album. She calls what she does “Organic Moonshine Roots Music,” but that somehow connotes on old-timey sensibility that doesn’t accurately describe the breadth of her influences nor how she incorporates them. The old-time roots influences are in her music, yet there’s a very modern feel to what she does. June has released several albums and also recorded an album with The Wandering, with Luther Dickinson (North Mississippi All-Stars), Amy LaVere, Shannon McNally, and Sharde Thomas. June is quite adept at fusing folk, R&B, blues, gospel, and country into a unique sound. June is playing the Tin Angel on August 15. This is one show you don’t want to miss. Born in Jackson, and raised in Humboldt Tennessee, singer-songwriter and multi-instrumentalist Valerie June is an exciting new addition to the roots music scene. June is releasing Pushin’ Against A Stone on August 13. The album was mostly recorded at The Black Key’s Easy Eye studio in Nashville and was produced by Dan Auerbach and Kevin Augunas (Edward Sharpe & The Magnetic Zeros, Florence & The Machine). Stream “You Can’t Be Told” here.